Welcome to the Homepage of the ThRaSH 2013 Workshop! 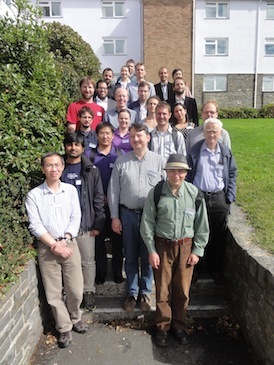 The 7th Workshop on Theory of Randomised Search Heuristics took place on 13-14 September 2013 in Aberystwyth, Wales. Where slides are available these can be found with the abstracts in the programme. Randomised search heuristics are a rich and diverse class of algorithms that are successfully used in various applications, both in combinatorial and numerical optimisation. Examples include evolutionary algorithms, ant colony optimisation, artificial immune systems, estimation of distribution algorithms, particle swarm optimisation, simulated annealing, and random local search. In contrast to problem-specific randomised algorithms, they are designed to be general black-box optimisers. Given such a scenario, proving that such algorithms satisfy certain performance guarantees remains a hard and widely open problem. Gaining a theoretical understanding of randomised search heuristics is therefore an important task. Since these search heuristics are first and foremost optimisation algorithms with stochastic elements, there is a clear potential in applying techniques developed in other research areas such as probability theory or "classical" optimisation (such as problem-specific algorithms and numerical optimisation) to analyse randomised search heuristics. The mission of the ThRaSH workshop series is to contribute to the theoretical understanding of randomised search heuristics. The aim is to stimulate interactions within the research field and between people from different disciplines working on randomised algorithms. The primary focus is on discussing recent ideas and detecting challenging topics for future work, rather than on the presentation of final results. The workshop was funded in part by EPSRC under grant N. EP/H028900/1.